Circle one element from any 2 categories. These will be your CONSTANTS. (i.e. circle “fast” under the BOW SPEED category, and circle “heavy” under the WEIGHT category”) This leaves your BOW PLACEMENT category as the wild card, or the VARIABLE ingredient. 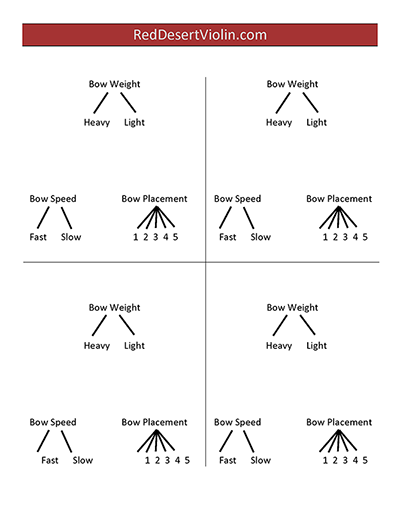 So, while keeping your bow speed FAST and your bow weight HEAVY, you must experiment with ALL 5 LANES of your highway, or Bow Placement. Choose different constants each day until you’ve done every possible combination. Choose one element from any one category, maybe something you struggle with. For instance, if you are bad at using lots of FAST bow, I would circle “FAST” under the “Bow Speed” category. Then, you will play with all possible combinations of the other 2 categories (Bow Weight and Bow Placement), keeping your bow moving FAST no matter what. Choose a dynamic, then figure out how to make a FAST bow speed sound the best. Next figure out how to make a SLOW bow speed sound the best. Try a MEDIUM bow speed. Do this for the entire dynamic spectrum from fortissimo to pianissimo. This exercise really pays off quickly! Adapt this worksheet to fit your own needs! Be creative, and have fun! Good luck!